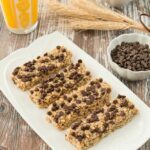 These easy no-bake homemade granola bars will have you and your kids absolutely delighted. They tastes so much better than the store-bought kind and are made with simple ingredients. Line an 8×8″ baking pan with aluminum foil and lightly grease with non-stick cooking spray. Set aside. In a large bowl, mix together the quick oats and rice cereal. Set aside. In a small saucepan, melt the butter, brown sugar, and honey over medium-high on the stovetop until it begins to bubble. Reduce the heat to low and cook for 2 minutes. Remove from heat and stir in vanilla. Pour the syrup over the dry mixture. Stir together until everything is moistened. Spoon the mixture into the prepared pan. Press down firmly to tightly compact the ingredients. Sprinkle with chocolate chips and lightly press the chocolate chip so they stick to the granola. Let cool for 2 hours or until the chocolate chips are set before cutting into bars using a sharp knife. Store in an airtight container at room temperature for up to 5 days or individually wrap in plastic wrap.